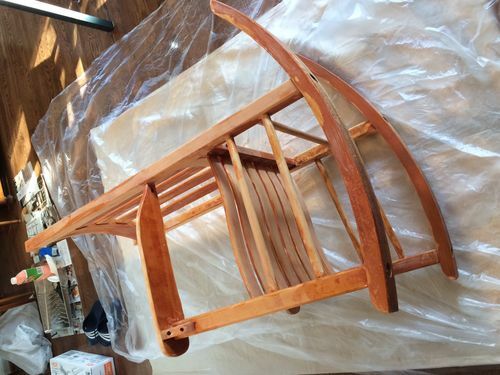 I am stripping a cherry rocker (using citristrip, a plastic spatula and steel wool) and would like to refinish it in a dark / blackish stain (the original stain was too orange). I will sand the chair with sanding paper once it’s completely stripped. I read that cherry wood is difficult to stain. I looked into the Minwax products and was wondering if I should used the oil based penetrating stain or the water based stain to get better results? Or, to avoid difficulties, would you recommend I use primer and cabinet paint? Some areas on the raw wood now show cloudy patches (where I could not get rid of all of the stain in the first go and reapplied the citristrip gel). I am concerned that they will show through the new stain. Below is a picture of the chair, partly stripped. ARRGHHH, you’ve likely done more damage with the stripper than if you had started with a cleaning process. It’s at a point you should look for total disassembly and a ground up restoration, since (depending on it’s age) the stripper can cause the glue joints to fail. Once disassembled you can fully clean and sand each part back to bare wood and then start with a dye process to get to the color you’re seeking, a stain over the dye for final color and then a final finish coat. Cherry is a beautiful wood. Please don’t paint it. Once you sand it down it will be very light, but will darken over time. A medium tone danish oil would be a great finish to bring out a little of the natural redness but still darken it ip. You could go over that with something like arm-r-seal to give it more protection. You could also start with a garnet shellac to darken it up. Over time it will turn a nice wine color. That would also need a topcoat like arm-r-seal. Thank you both. The chair is about 10 years old, and I haven’t used tons of stripper around the joints, so I will try finishing this project without a full disassembly. I will try Danish oil instead of Minwax.